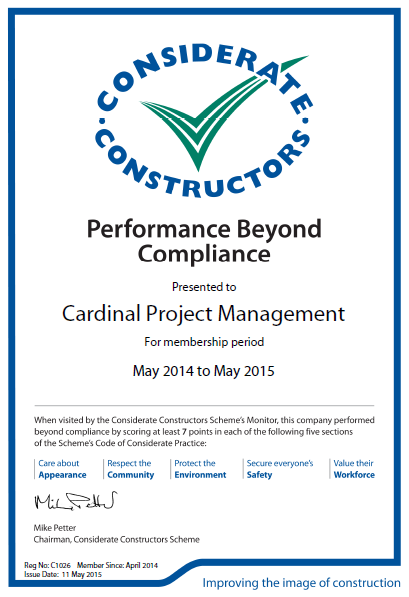 Cardinal has out performed the Scheme’s Company Code of Considerate Practice by achieving a score of 7 or above in each of the five sections. Care about Appearance and ensure sites appear professional and well managed. Respect the Community and give consideration to their impact on neighbours and the public. Protect the Environment and enhance the environment. Secure everyone’s Safety and attain the highest levels of safety performance. Value their Workforce and provide a supportive and caring working environment. Considerate Constructors is the national initiative set up by the construction industry to improve its image. Cardinal have registered with the Scheme and are monitored against a Code of Considerate Practice designed to encourage best practice beyond statutory requirements. Cardinal were audited on two H&M sites at Lincoln and Hounslow where they were appointed as main contractors. Steve Sheriff was the Project Manager for Lincoln and Paul Hobson took charge of the Hounslow project. “This is an excellent result from all teams on site considering how busy we were last year”, said Jo McShera, HSQE Manager.